“Is this normal?” asked Agnes Scott College’s newest head Cross Country Coach, Molly Carl, referring to a 90-degree fall day last year, “Shouldn’t it have cooled off a bit by now?” Welcome to Hotlanta! While this Northerner may still be acclimating to Georgia’s sweltering heat, Coach Carl is very familiar with successful cross country running. Prior to arriving to Agnes Scott College, Coach Carl was a standout cross country and track athlete at Southern Maine University. 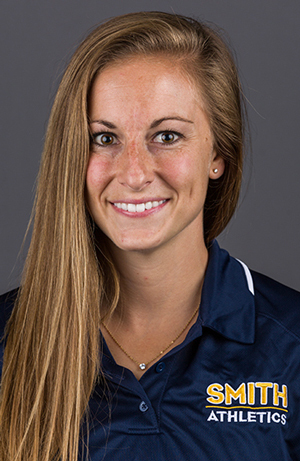 Following undergrad, she was an Assistant Cross Country Coach while obtaining her Master’s degree in Exercise and Sport Studies at Smith College. Coupling her experiences and enthusiasm for the sport, Coach Carl is ready to lead the Agnes Scott Scotties to cross country prominence. 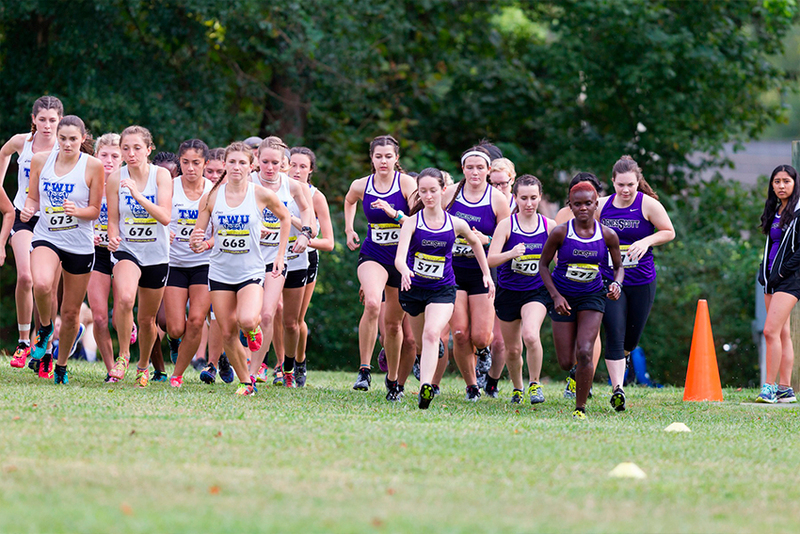 Collegiate cross country running is usually between 2 to 3.7 miles on non-paved paths and is an intensively aerobic exercise. In other words, it is exercise that improves and requires the body to absorb oxygen efficiently. 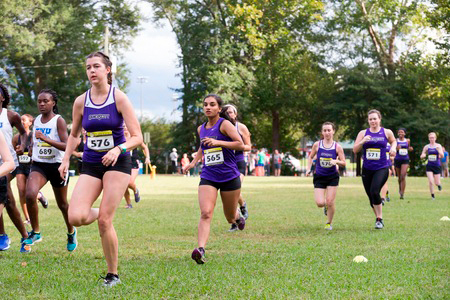 Well acquainted with how to get runners prepared to compete, Coach Carl came to Agnes Scott with “a vision and a plan for the program and it got people excited to join forces with her” according to Agnes Scott College’s Cross Country Graduate Assistant Coach, River Bonds. 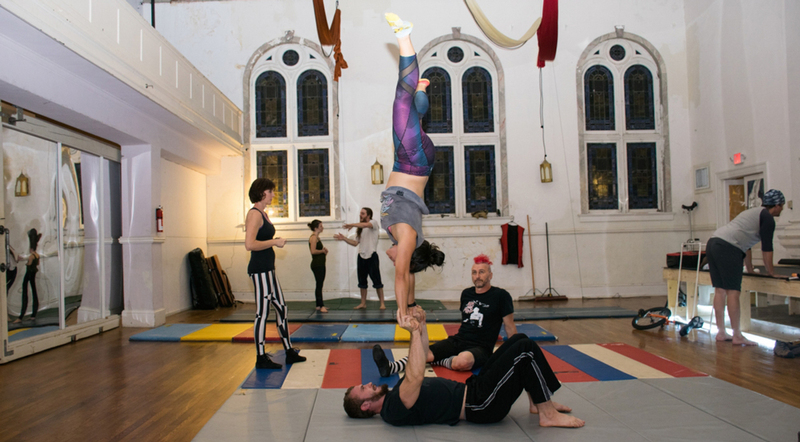 Coach Carl trains Agnes Scott athletes with the same science-based training program that led her to All-American status as a collegiate athlete. Like an astute writer, she uses an outline to guide the training schedule. “I see where our championship races are, then work backwards,” explains Coach Carl. 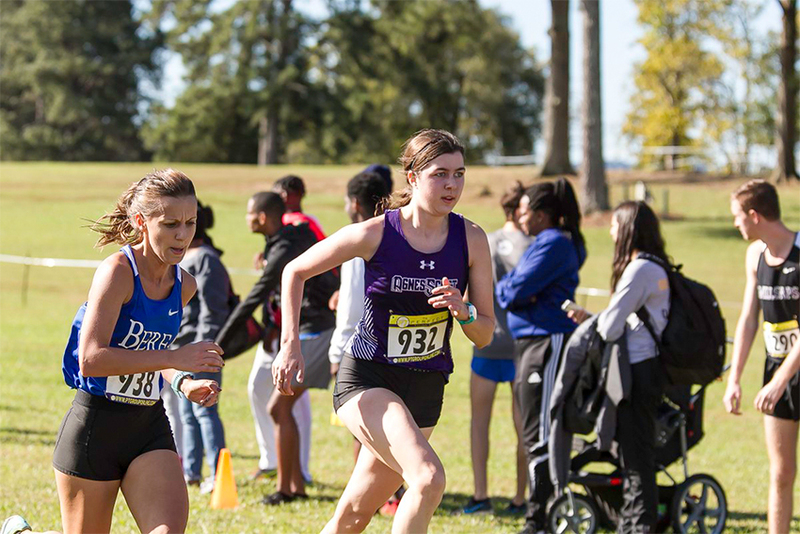 This approach of reverse chronological planning is standard for coaches from all sports to properly peak their athletes for late-season competitions – Agnes Scott’s championship cross country races are usually in November. Next, Coach Carl lays out four, six-week training phases to prepare her athletes for November’s races. In each training phase, specific workouts are featured to enhance certain body processes that improve distance-running performance. Naturally, the initial training phase is the easiest, as its primary goal is to re-acclimate the athletes to running consistently. Coach Carl may advise athletes who did not run competitively during the spring to build up to running 15 to 30 miles per week over this phase. Not only does this phase prepare athletes for more rigorous training, but it elicits adaptation that improve distance-running performance. For example, to keep running, leg muscles need a constant supply of oxygen-rich blood, like a car engine needs gas. Consistent running increases the stroke volume, the volume of blood pumped from the heart with each beat, which improves the body’s ability to circulate oxygenated blood to leg muscles and keep running. 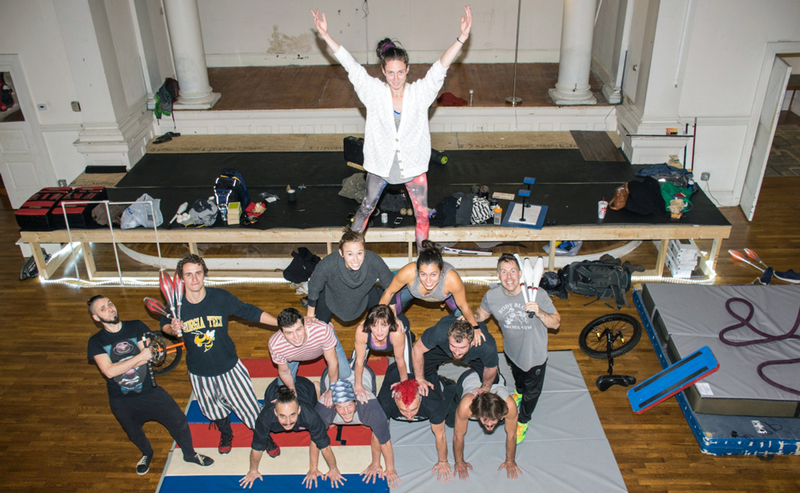 Once the initial adaptations are in motion, Coach Carl’s athletes transition to the second training phase, where “repetition” workouts are introduced to their weekly schedule. Repetition workouts entail running relatively short and fast intervals with long recoveries between repetitions. For cross country athletes, repetitions workouts are generally 200 to 400 m (a half to full length of an outdoor track) at current mile race pace with 1 to 8-minutes rest. The primary goal of these workouts is to improve athlete’s running form, since optimizing form maximizes performance. Improved running form may decrease the rate of energy that an athlete expends while running a given speed. This is analogous to how much gas a car burns while driving at a constant speed (less gas is better). While considering other factors, athletes who consume less energy to run at a given speed can outperform their competitors by having the ability to run farther at a given speed and faster at given aerobic intensity. “…Then I get them for the next two phases… when they are back on campus” continues Coach Carl. You read that correctly, 12 of the collegiate 24-week training program is completed prior to the first day of practice. “You have to be intrinsically motivated to do well”, she adds. Indeed. Athletes are welcomed back to school by the most difficult training phase. By now, each week athletes run multiple easy days, two structured workouts (e.g. repetition workouts), and a long run. Long runs are ~25% of the respective athlete’s weekly mileage (e.g. ~10 mile long run for an athlete running 40 miles a week) and serve to improve the number of blood vessels that transport oxygen to exercising muscles. Notably, the primary goal of the third training phase is to increase the maximum rate of oxygen that an athlete can uptake, transport, and utilize to generate energy. Much like how football players love 40-yard dash times, this is the measure that endurance athletes obsess over due to its close relationship with distance-running performance. To increase her athletes’ maximum rate of oxygen uptake, Coach Carl has the team perform classic “interval” workouts that consist of 3-5 minutes of intense running with 2-3 minutes rest between intervals. Another intense, albeit a more enjoyable, aspect of phase three are the beginning of cross country races. Cross country races are generally 2.0 to 3.7 miles and start around the end of August or beginning of September. Ideally, Coach Carl’s team runs 5 to 6 races before the November’s championships. The final training phase is intended to simultaneously improve another physiological process and freshen the athletes up for the key races. Physiologically, to sustain a relatively fast running speed, athletes expend energy without the presence of oxygen at the muscle-level. If athletes expend too much of this energy source, their blood will likely become more acidic than normal, resulting in the sudden feeling of having heavy legs. To train the body to buffer this race-slowing feeling, athlete’s run workouts include a moderately hard continuous run (e.g. 20 minutes) or multiple repeats with short rest (e.g. 5-minute intervals with 1-minute rest). These workouts are perfect for the final training-phase because they are also relatively easy to recover from due to their controlled intensity. In the last few weeks of the season, athletes decrease their overall weekly mileage to enter the championship races rested and ready. Even though this science-based training approach develops key physiological parameters that influence distance-running performance, Coach Carl carefully customizes the training of her athletes as the season progresses on an athlete-by-athlete basis. “You cannot just plug a human into a system and be like this should totally work out” she says with amusement. Subtleties like altering training to handle life events, mimicking training environments to resemble race courses (e.g. incorporating hills to prepare for hilly courses), and developing race plans that cater to each athlete’s strength are just a few ways that Coach Carl artfully brings science-based training to life. Whether you are preparing to get back into shape, run in the world’s largest 10-kilometer race (Atlanta Track Club’s Peachtree Road Race), or guide athletes through their cross-country season, these science-based training methods can be helpful. After all, what do you have to lose? Except for a few minutes on your next race. 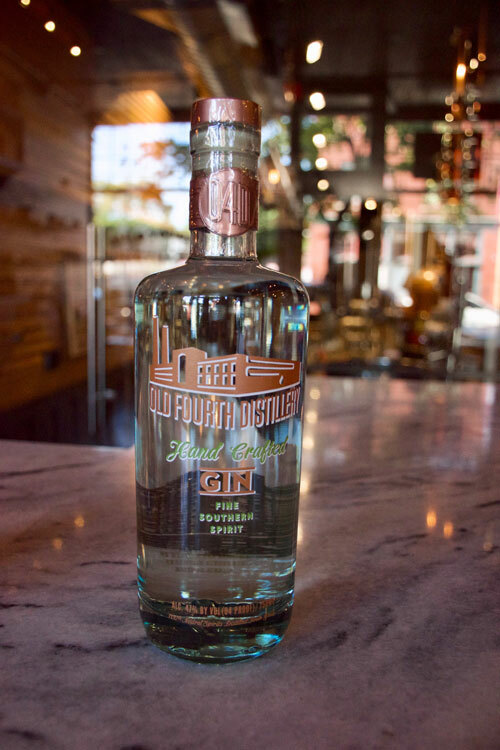 Old Fourth Distillery, nestled in the heart of Old Fourth Ward, is well known around Atlanta as a purveyor of hand-made vodka, gin, and their signature ginger lemon liqueur, Lawn Dart. 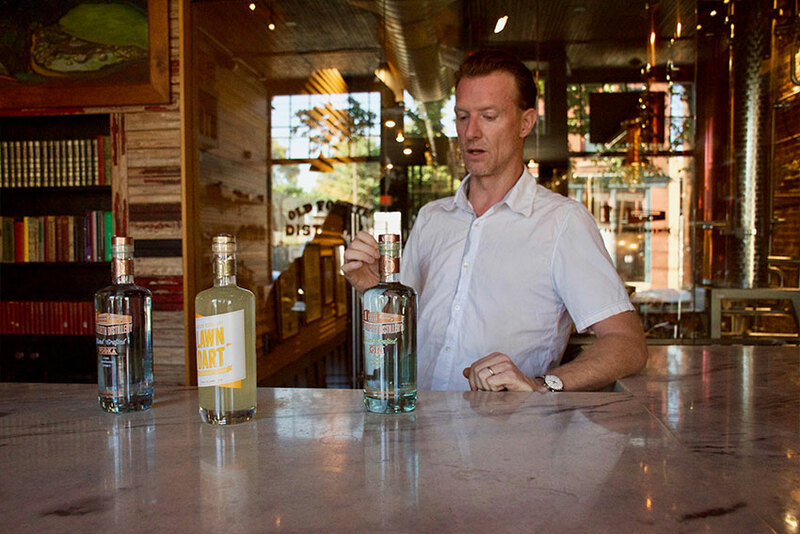 It hasn’t always been easy to get locally sourced spirits, though. 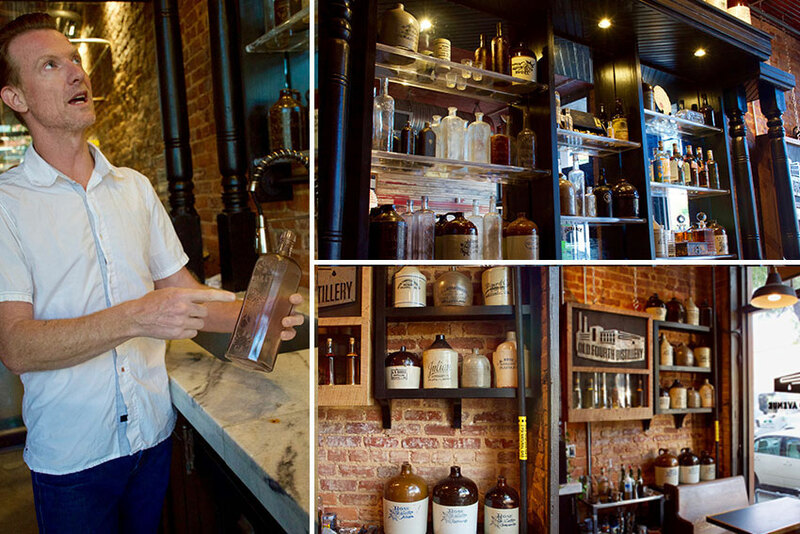 In fact, Old Fourth is the first legal Atlanta distillery in over 100 years, due to the temperance movement that forced prolific distillers like R.M. Rose & Company out of the city. 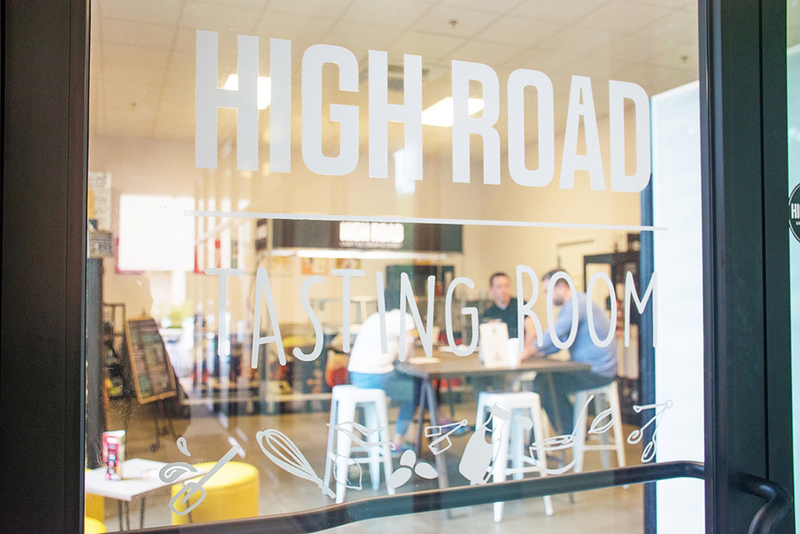 “There’s a really rich history of distilling in Atlanta,” says Jeff Moore, one of the two founding brothers of O4D. If you look closely, you’ll notice that the distillery is teeming with artifacts of the distillers that came before them – some bought, others donated by generous collectors and enthusiasts. The Moore brothers have a refreshing reverence for history, honoring the folks that pioneered their craft in all they do. Each aspect of the distillery – from the construction of the physical space, the antiques filling each nook and cranny, the design of their bottles and labels, and the spirits they create — has been thoughtfully considered. Each bit is a nod to history, an appreciation of the past. For instance, many of the materials used to build the space were salvaged and repurposed from the demolition of John B. Gordon Elementary School, a historic, once bustling East Atlanta school built in the early 1900s. 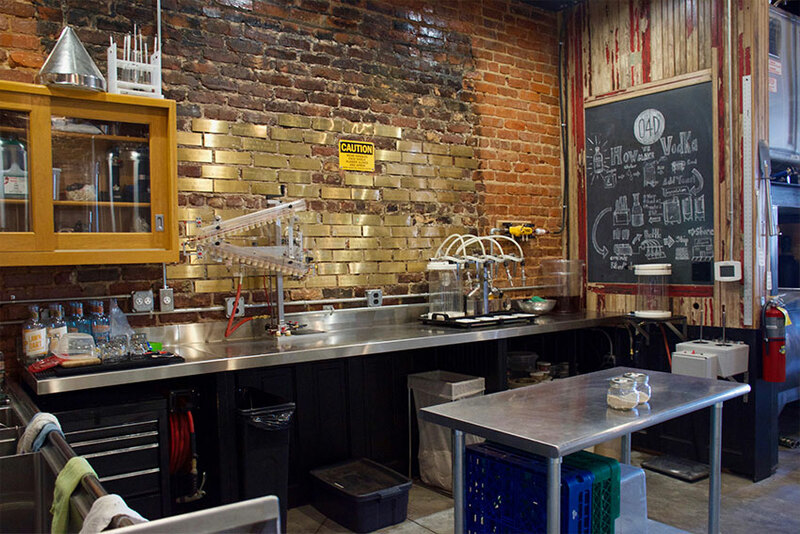 The distillery’s marble countertops once served as dividers of the school’s boys’ and girls’ bathroom stalls, and is said to have come from the same batch of marble — mined in Tate, Georgia at the turn of the century — that the Lincoln Memorial is made of. Jeff acknowledges that although it takes significant work to upcycle old materials in place of buying new ones, it’s worth it. 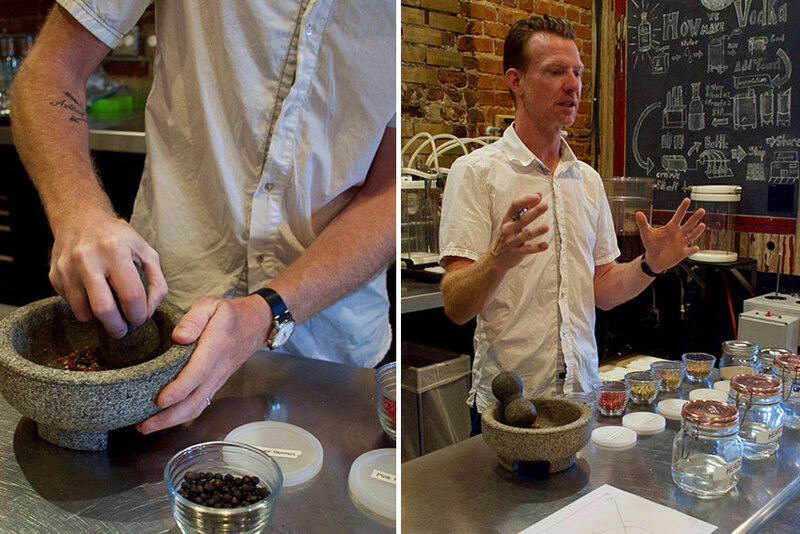 “We talk about being stewards of the materials that we use,” he says. 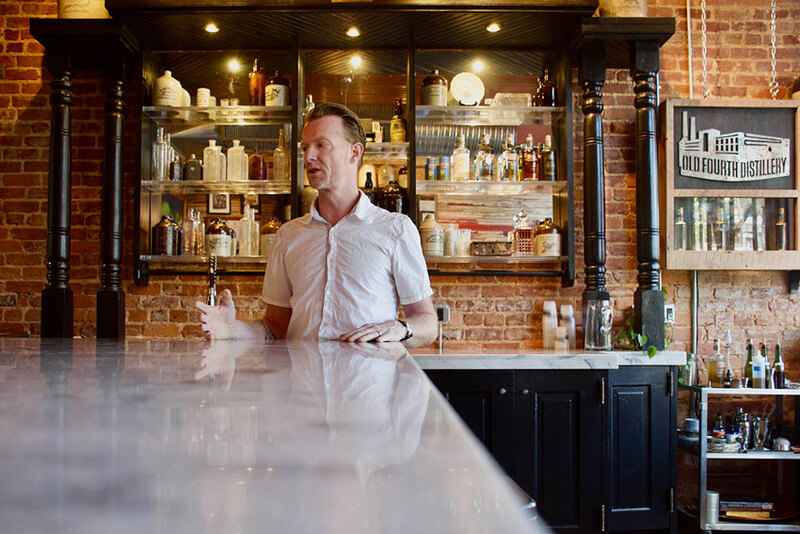 The Moore brothers’ thoughtfulness extends to the science behind their craft, too, and necessarily so – creating spirits is actually more complicated than you might think. At its core, distillation is the process of strategically separating liquids through condensation (which means converting water vapor into liquid water) and evaporation (converting liquid to a gas). 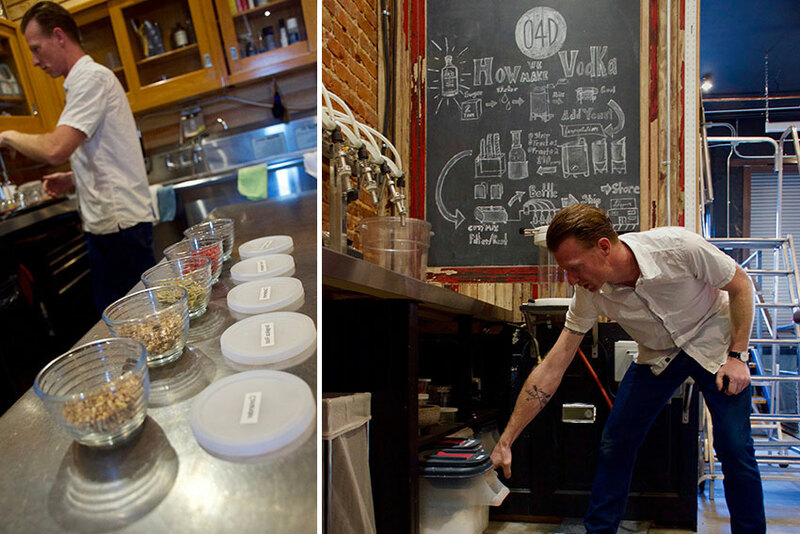 But to make gin, vodka, or bourbon, for that matter, it all begins with yeast. 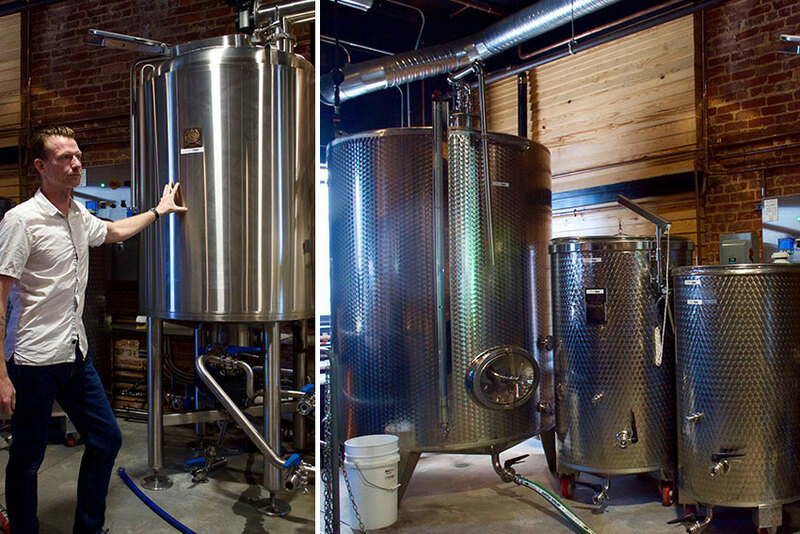 Similar to wine- or beer-making, creating liquor begins with fermentation, or the conversion of sugar to alcohol and carbon dioxide. 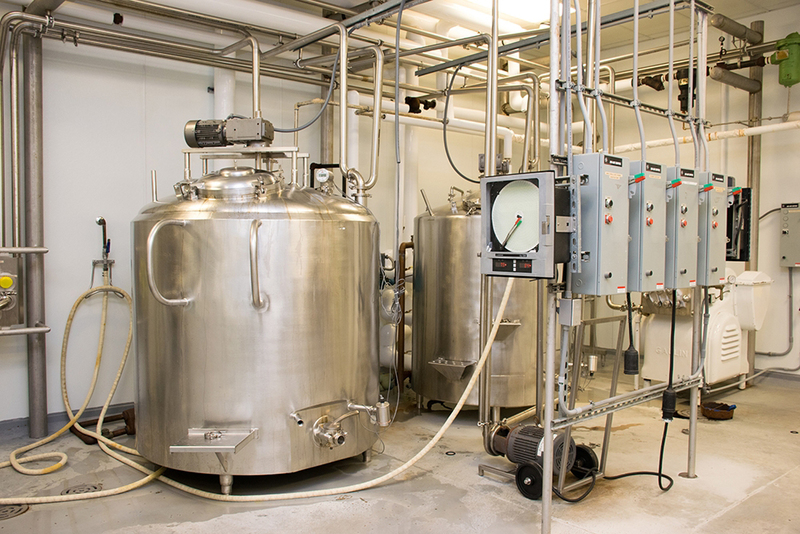 At O4D, they’ve developed a specific protocol for each type of liquor they make, each requiring a particular strain and precise amount of yeast. As such, each batch of yeast must be fed and grown precisely. When making vodka, for instance, Jeff and his team add carefully measured amounts of cane sugar, nutrients, calcium carbonate (to balance the pH), and a few other ingredients to their yeast, and then grow the cultures at specific controlled temperatures. The yeast undergo multiple cycles of heating and cooling over the next five days, coordinated by human-powered thermostats and control valves galore. As the yeast convert sugar into alcohol, they eventually run out of sugar to consume and ultimately create a 13% alcohol mixture. The thing is, yeast don’t like living long-term in 13% alcohol. It’s toxic to them. That’s where distilling comes in. 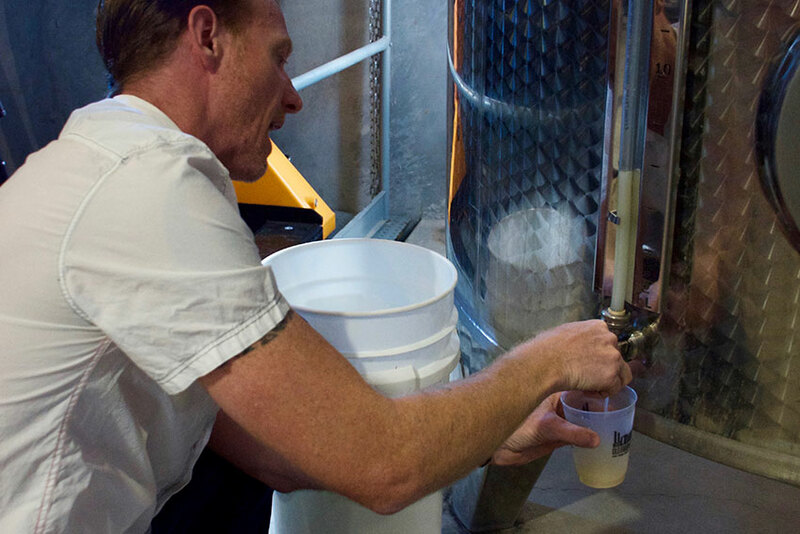 To get to that higher alcohol content, Jeff and his crew must physically separate the alcohol from the rest of the mixture. Basically, since the boiling point of alcohol is lower than water, distillers can strategically evaporate the alcohol from their mixture. The next step is to collect the vapors, separate them from the water, and cool them down, thus condensing the vapor back into a liquid. This is all done in a device called a still. At O4D, they use a custom, handmade CARL copper still. It seems like magic, but it’s science: in a single run, the 13% alcohol mixture becomes 50% alcohol. Jeff and his crew then run the mixture twice more through their still. 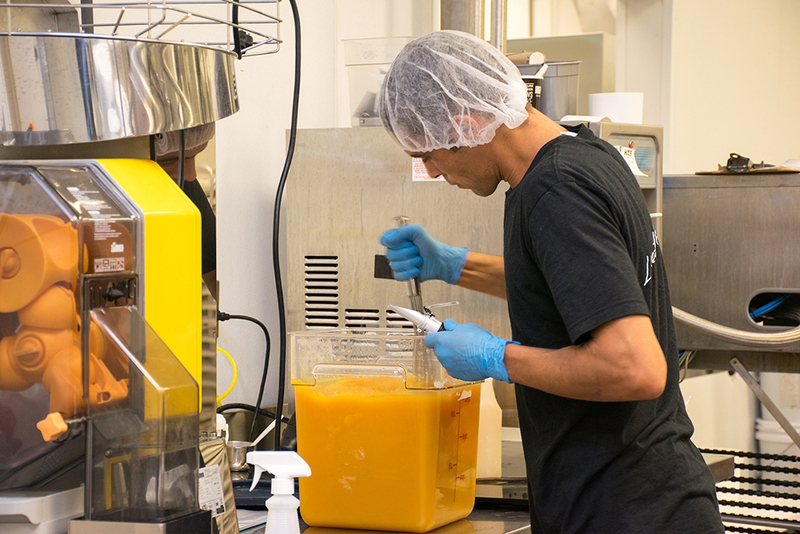 For each and every run, the still operators keep detailed logs, tracking which batch of sugar they used, how much of each ingredient they used, any time or temperature tweaks they made throughout the process, and characteristics of the final product. The evaporation process of distilling isn’t completely clear-cut – the alcohol you want is inevitably mixed in with some chemicals you don’t want. Jeff explains that with careful temperature and timing control, he can separate out the parts they don’t want and keep the parts they do. What comes off first at the lowest temperatures – the heads – are quite toxic, with a distinctly chemical-y smell. The heads get sent off (no joke!) to fuel companies to repurpose for methanol. What comes off last at the highest temperatures – the tails – are lower alcohol content and contain unappetizing oily substances. “It’s very … oily band-aids,” Jeff laughs. 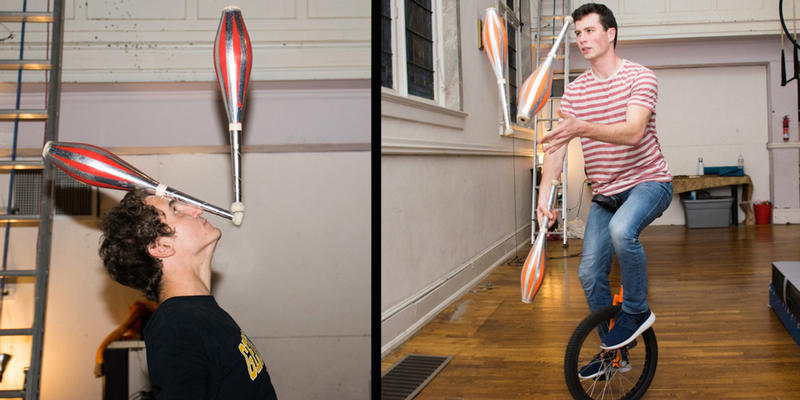 As with most things, it’s all about finding balance. 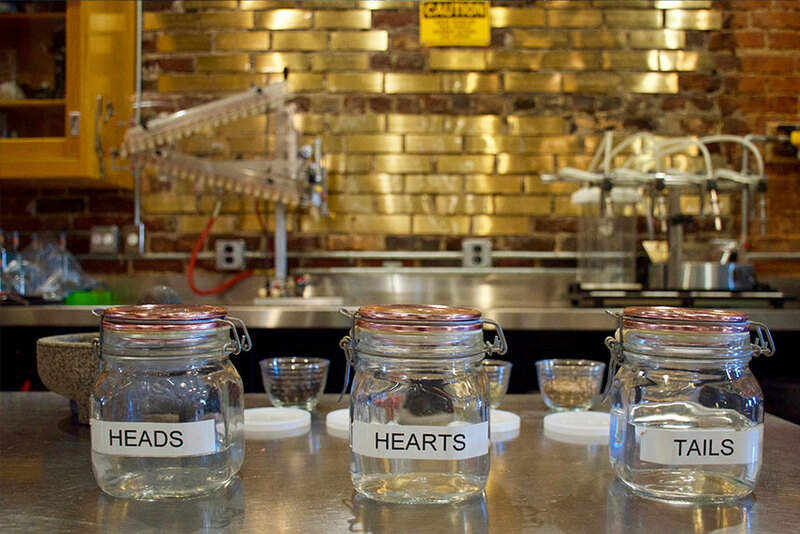 The optimal middle portion — the hearts — undergoes a few more finishing steps before it’s ready to be bottled, including a sometimes week-long “resting” phase to let everything settle. 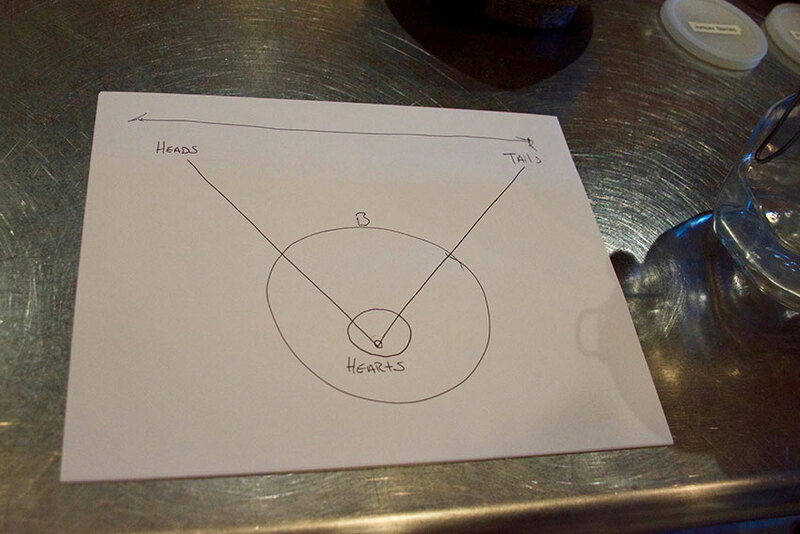 When it comes to making spirits, there’s both an art and a science to it. Vodka, gin, and bourbon require very different starting materials, temperatures, time schedules, and manipulations along the way. No two gins are exactly the same, either. On those long days spent waiting for those heads, hearts, and tails to come off the still, Jeff and his colleagues fill the idle time with experiments on a smaller 20-liter still. 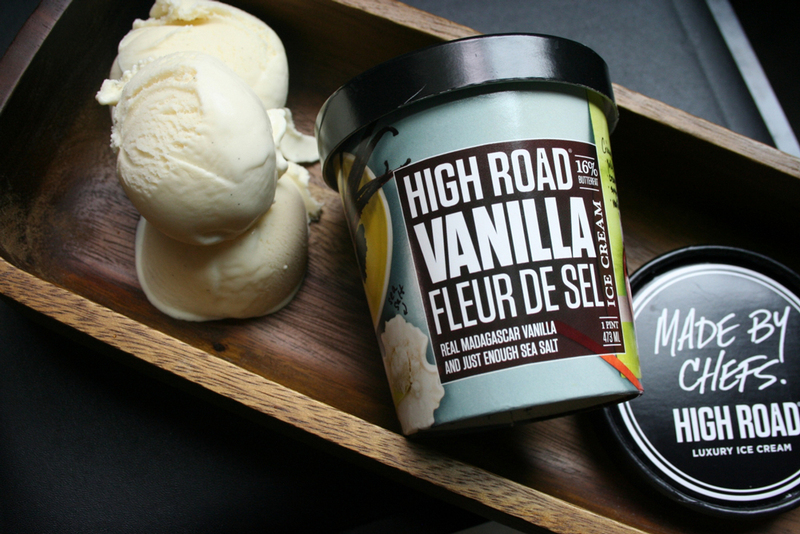 They play around with different ingredients, temperatures, and flavors, always chasing their curiosities and, ultimately, enhancing their craft. 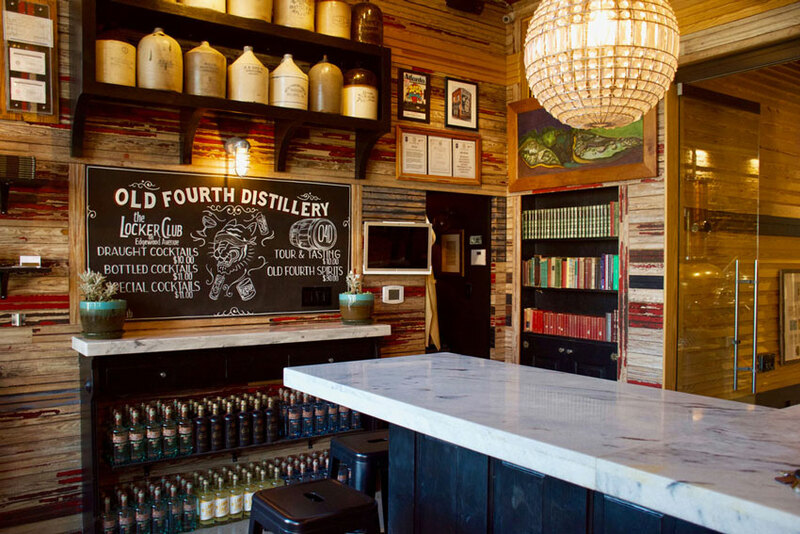 Since Old Fourth Distillery opened its doors in 2014, they’ve made an effort to connect with their community through tours, tastings, and community collaborations. This summer, for instance, they teamed up with Atlanta United to create a limited edition gin that has been enthusiastically received by fans. Old Fourth finds other ways to give back as well, like maintaining the gravesite of historic distiller R.M. Rose, which is nearby at Oakland Cemetery. They’ve made gin in Rose’s honor, using juniper berries picked near his gravesite. O4D has also forged a friendship with their upstairs neighbor, The Railroad Model Club of Atlanta, periodically helping them with upgrades and generally supporting their endeavors. With so much intention and precision behind all they do, O4D is poised to serve southern spirits to Atlanta for years to come. To keep up with new releases and updates or to schedule a tour, visit the O4D website. You can also connect with them via Facebook or Twitter. 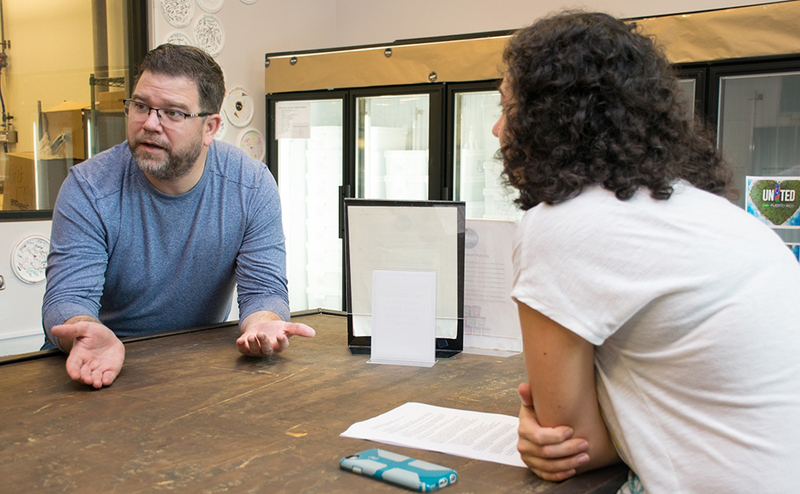 If you’re curious about the history of distilling in Atlanta, Jeff recommends the book Prohibition in Atlanta by Ron Smith and Mary O. Boyle. You might not expect it, but nestled just southeast of the city limits of Atlanta lies a 40-acre oasis of grazing pastures and scrubby brush that 40 adorable adult dairy goats call home. Those in the know will tell you it’s where to find the best goat cheese in town — Decimal Place Farm. 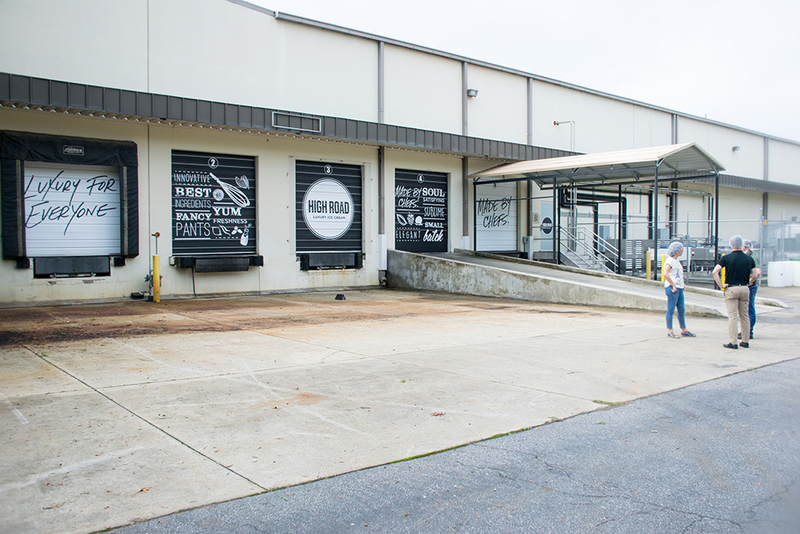 A mere 11-minute drive from the Starlight Drive-In Theatre, Decimal Place thrives as a source of freshly made cheeses, delivering feta, mozzarella, creamy chevre, and cheddar to grocery stores, farmers markets, and well-known restaurants around Atlanta. Mary Rigdon has been running the farm since her family took over the land in 1995, and is a tried-and-true expert of her craft. With a degree in animal science and background in research with pigs, sheep, and cattle, she’s incredibly knowledgeable when it comes to animals. And it shows – she’s raised her herd of Saanen dairy goats since they were little, and they are noticeably trusting and calm in her presence. Mary fell in love with Saanen goats – a breed originating from the Saan valley in Switzerland — for their sweet temperaments and superior milking qualities. Over the years, she’s carefully bred and selected her goats for their impressive milk production, as well as their physical characteristics. Most days, you can find the goats happily roaming and grazing around the 40 acres of farmland, rotation of which Mary strategically orchestrates to keep both the land and goats healthy. When baby goats are born, the mother starts giving milk – called lactation – and generally, each goat gives milk for approximately 300 days. The goats at Decimal Place Farm usually give about a gallon a day, if not two, for those 300 days, and Mary and her crew turn it into cheese. Mary isn’t shy about diving into the science behind it all, either — from the selective breeding to optimization of milk production, to the science behind different kinds of cheeses. Her enthusiasm is palpable as she explains lactation, sketching a curve on the notepad in the milking room. She explains that, after extensive calculations and cross-referencing of milk records, she’s selected for goats that maintain a long, level lactation curve, rather than a large, brief spike in milk production. 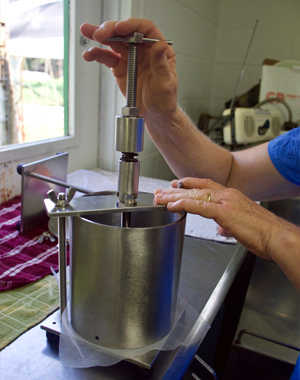 The process of making cheese starts in the milking room. Mary’s milking room facility accommodates up to ten goats at a time, each of which gets personal attention to ensure they’re in tip-top shape before beginning. Not only are the goats tested in advance for tuberculosis, brucellosis, and other diseases, but their milk undergoes a quick, simple test that confirms each goat is in good health and thus producing healthy milk each day. Once the goats’ udders are dipped with a bleach solution and wiped clean, and their milk is deemed infection-free, the milking process begins – either by hand or by a vacuum-driven machine that mimics the action of a squeezing hand, gently pumping the milk to a receiver. When the receiver fills up with milk, the milk completes an electrical circuit, activating a pump that transfers the milk up and through the wall to a bulk tank. The milk stays chilled in the bulk tank until Mary’s ready to make the cheese, which is typically the same day the goats are milked. Each day is different, with local chefs and restaurants requesting a variety of cheeses in different quantities. Mary makes sure she’s ready for anything. 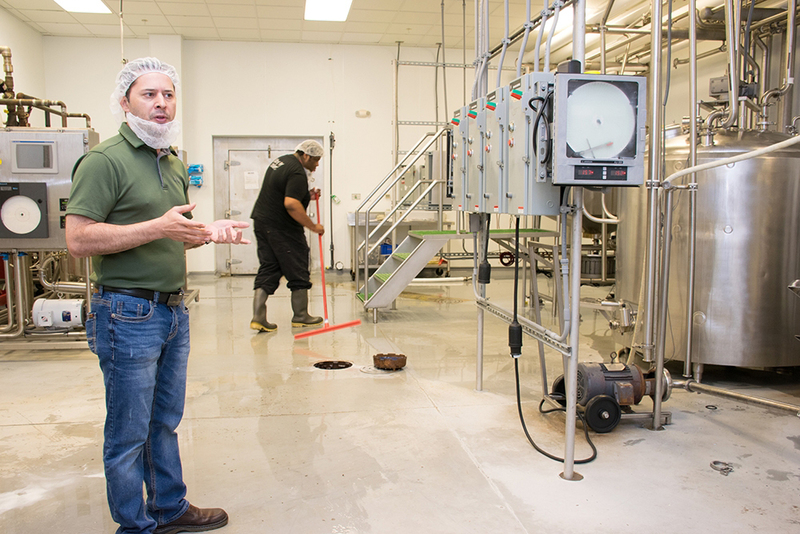 Each batch of milk is first pasteurized – heated above 146 degrees Fahrenheit for 30 minutes – in order to kill any harmful bacteria, then cooled back down. 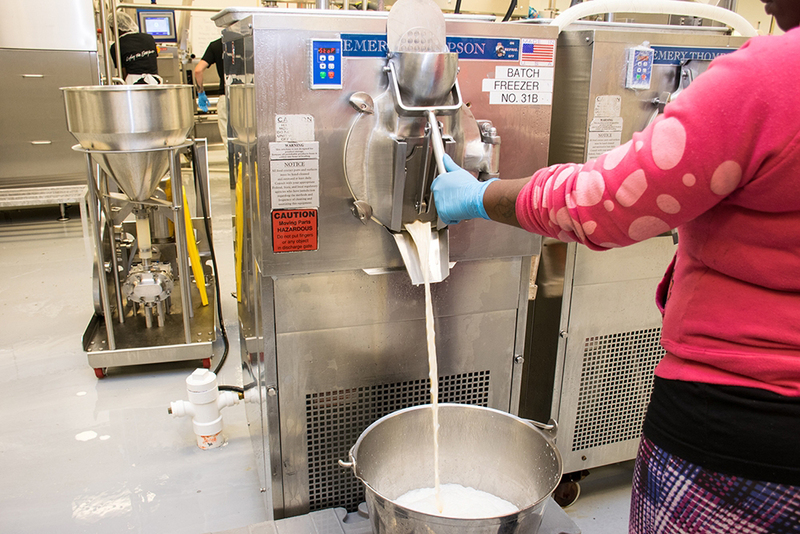 From there, small batches of milk are processed at a time, undergoing slightly different processes to achieve the desired consistency and taste. In each case, the basic concept is this: milk exists as an emulsion, meaning that microscopic clumps of milkfat proteins are suspended in a mostly watery environment. At the heart of cheese-making is simply removing the water from milk, concentrating the proteins and fats that are already there into solid curds. 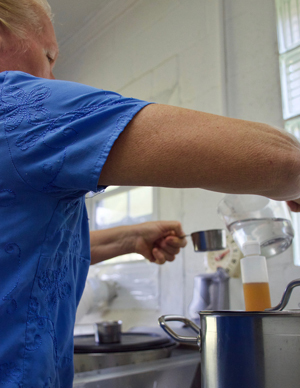 To begin the process, Mary adds a starter culture of mesophilic (or medium heat-loving) bacteria, which helps “ripen” the milk, converting milk sugar to lactic acid. This helpful bacteria culture helps the good bacteria in the milk flourish and ultimately makes the chemical conditions just right to develop the desired flavor and texture of the cheese. Mary explains that milk contains two types of proteins: casein and whey. Casein proteins have little tails that form a protective surface, preventing the molecules from clumping together. During the process of cheese-making, Mary adds an enzyme called rennet, which slices those little tails off the casein proteins. As a result, the casein proteins begin to lump together – called clotting or coagulation, which sets off a domino-like effect until nearly all of the molecules have clumped together. 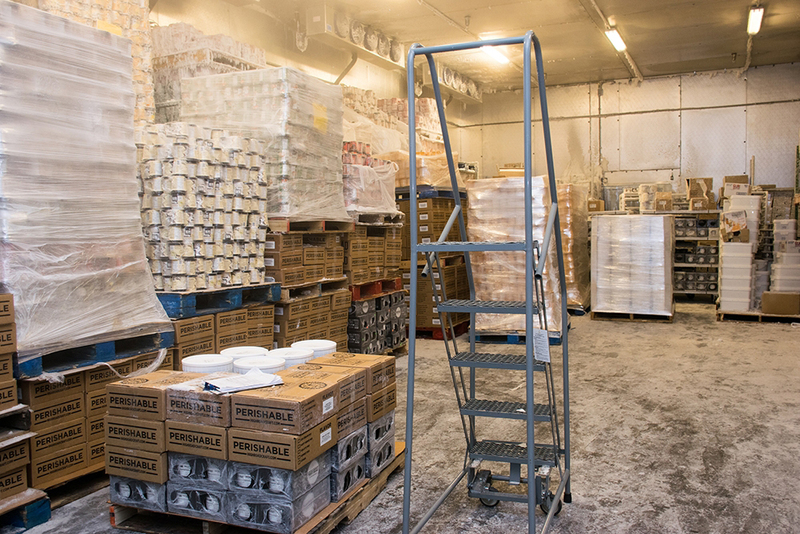 The milk is converted to a solid – called a curd – and the remaining liquid portion (called whey) is separated. You can make any kind of cheese with the goat milk, Mary explains: but it’s the temperature, the time, and the amount of good bacteria and rennet you add to the milk that makes the difference. For instance, to make Decimal Place Farm’s signature creamy chevre, Mary adds her culture of good bacteria to a pot of milk with just 5 drops of rennet – a little bit goes a long way with that stuff. Compared to other cheeses, creamy chevre requires more culture, less rennet, a lower temperature, and a much longer incubation time. She explains that she makes feta cheese using a larger amount of rennet, a much shorter incubation time, and a higher temperature, so the bacteria grow more quickly. 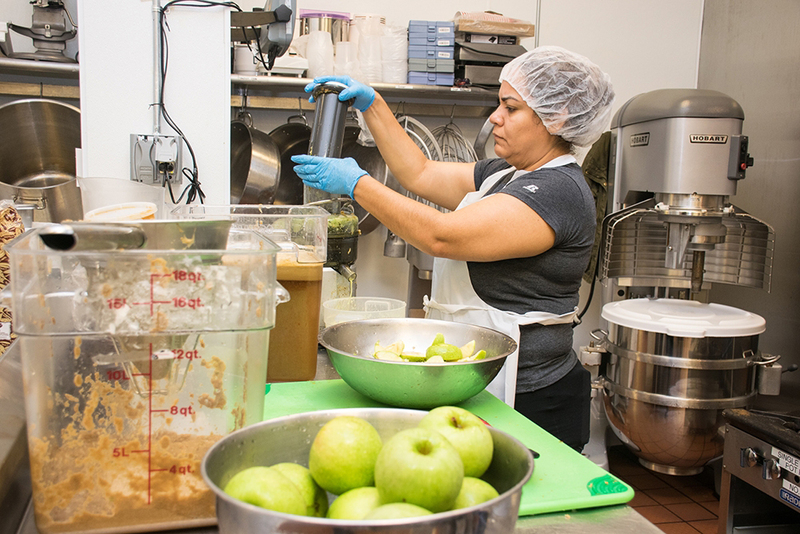 Over the years, she’s developed a precise protocol for each type of cheese, giving each type a signature flavor that keeps folks coming back for more. “Now there’s the art, and there’s the science,” she says with a smile. Once separated into curds, each type of cheese undergoes a slightly different process to achieve the proper amount of moisture. Most undergo a combination of pressing, scooping, straining, slicing, and salting, the protocol varying a bit for each. Creamy chevre has the highest moisture content of all the cheeses, while cheddar – which requires a few extra steps – has a much lower moisture content, and can keep much longer as a result. “Making cheddar is a long, involved process,” Mary explains, as she twists the handle of a cheddar press, mechanically pressing the cheese to remove excess moisture. Cheddar cheese undergoes several rounds of moisture removal before it’s sealed in wax, then aged. When she’s not tending to goats or making tasty cheeses, Mary shares her love of science through her passion for teaching. She regularly leads tours and classes on the farm to curious folks of all ages, guiding groups through pastures and leading cheese-making demonstrations. Her enthusiasm is infectious as she describes why some cheeses are yellow, while others are white: cows transfer carotenoids (a natural pigment found in grass) from their diet to the milk, where they bind to the fat and end up in the curds. 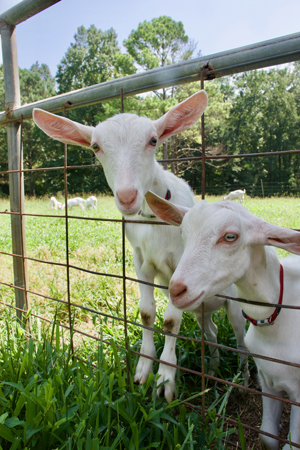 Goats, however, (along with sheep) do not pass carotenoids to their milk, so their milk is white. Her extensive knowledge comes in handy, especially when she encounters folks with allergies or intolerances to cow’s milk. Whether you’re allergic to cow’s milk or not, the cheese at Decimal Place Farm is absolutely worth a try. If you’d like to check out some of Mary’s cheese for yourself, you can find her at the Freedom Farmers Market at the Carter Center each Saturday. You can also find her cheeses at the East Atlanta Village Farmers Market on Thursdays, and at Rainbow Natural Foods in Decatur. 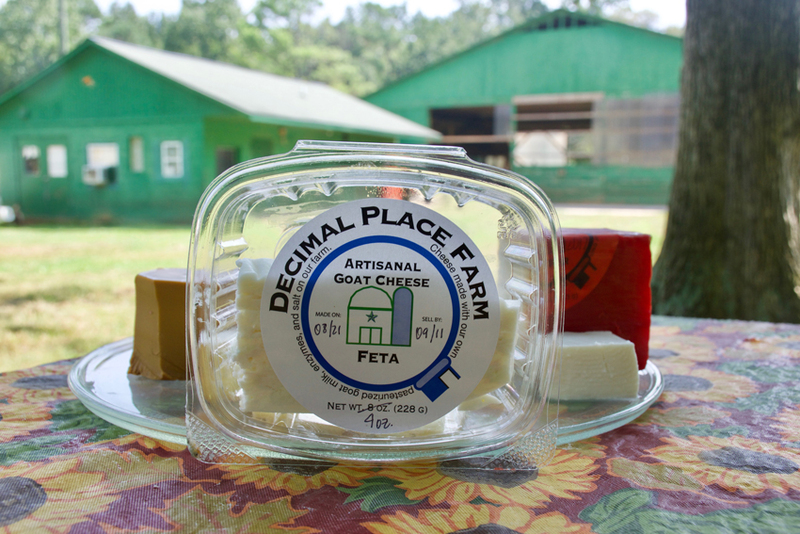 For more information about Decimal Place Farm and where to find their cheeses, you can find them on Facebook, Instagram, or visit Decimal Place Farm’s website. In case you missed our Twitter Chat with Emory Healthcare physicians, Dr. Scott Boden and Dr. Amadeus Mason, check out the conversation on the science behind sports medicine here. 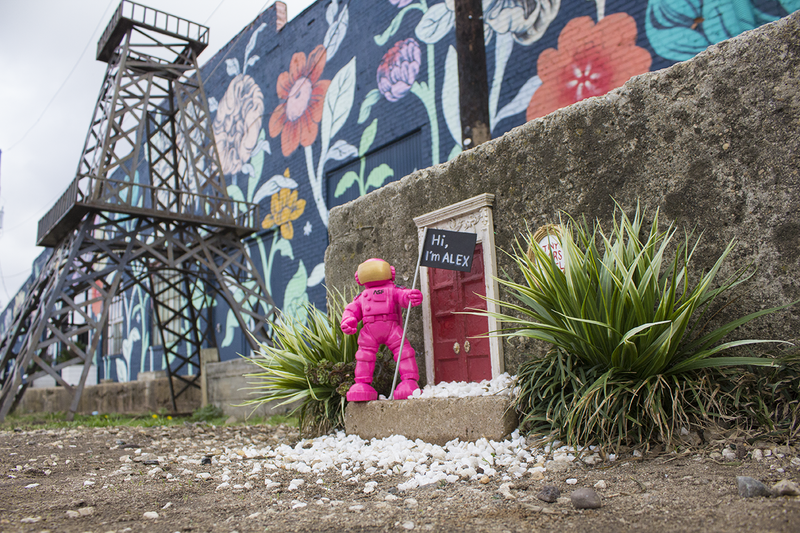 Tiny ALEX (Atlanta’s Lead EXplorer) is ready for #ATLSciFest 2018 and has started to explore the city by visiting one of Atlanta’s most prized public art exhibits – Tiny Doors ATL. 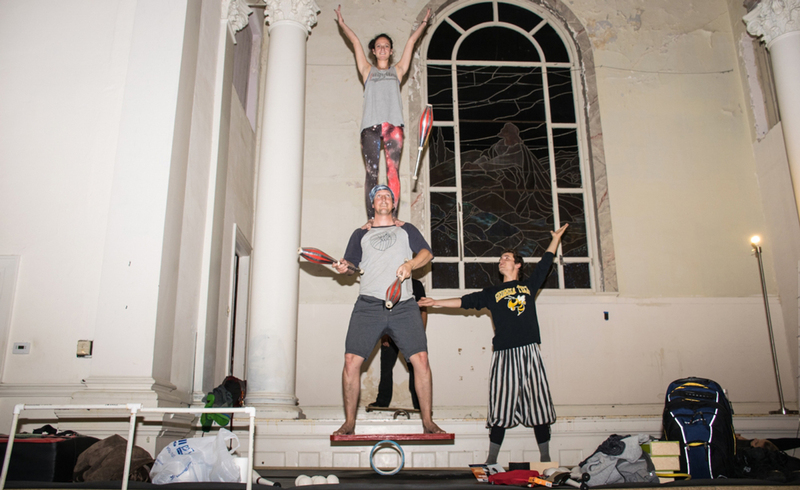 Founded in 2014, Karen Anderson and Sarah Meng created this Atlanta-based art project consisting of evolving interactive installation pieces that bring wonder to tiny spaces. Principal Artist and Director Karen Anderson maintains the doors throughout the year and now focuses much of her time on creating tiny art for small businesses and companies. We can thank Karen for our wonderful Tiny ALEX! 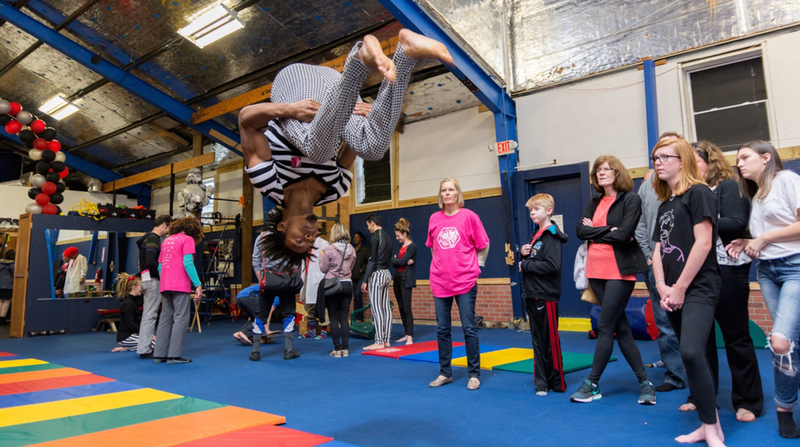 ALEX and the Atlanta Science Festival love collaborating with local organizations that offer Atlantans accessible STEAM (Science, Technology, Engineering, Art, and Mathematics) experiences. We’re very thankful to Tiny Doors ATL for doing just that! 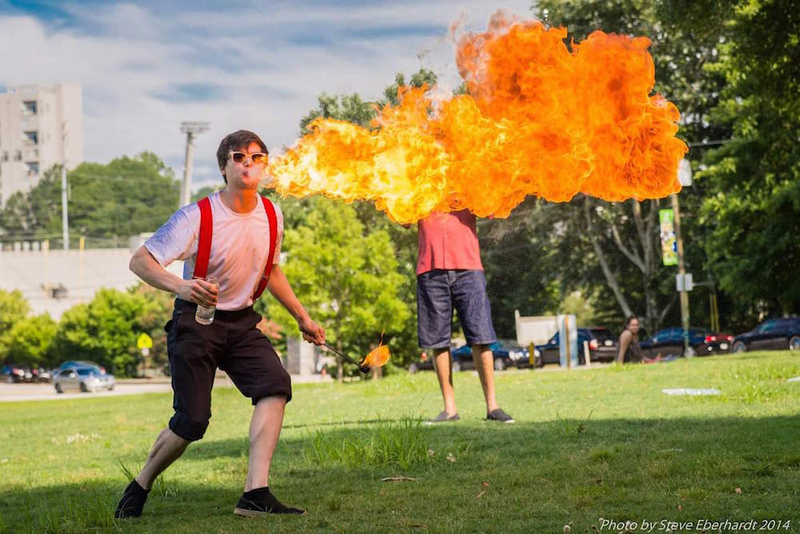 If you’re looking for even more Atlanta STEAM experiences, this year’s Atlanta Science Festival March 9 through the 24 has you covered. The Festival launches on Friday, March 9 with Rise Up, Robots! at the Ferst Center of The Arts and ends with our free Exploration Expo at Piedmont Park on March 24. Plus over 100 events that take place in-between. Plan your festival experience today! 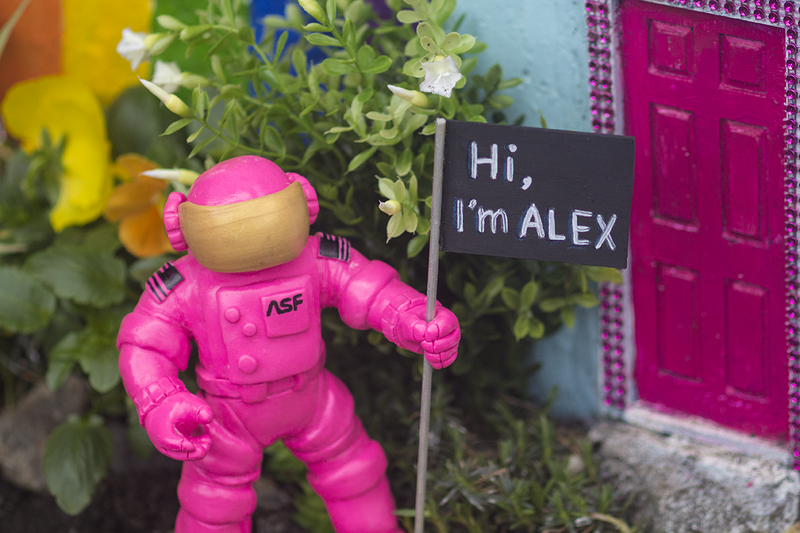 And who knows, you just might meet a life-size ALEX along the way. 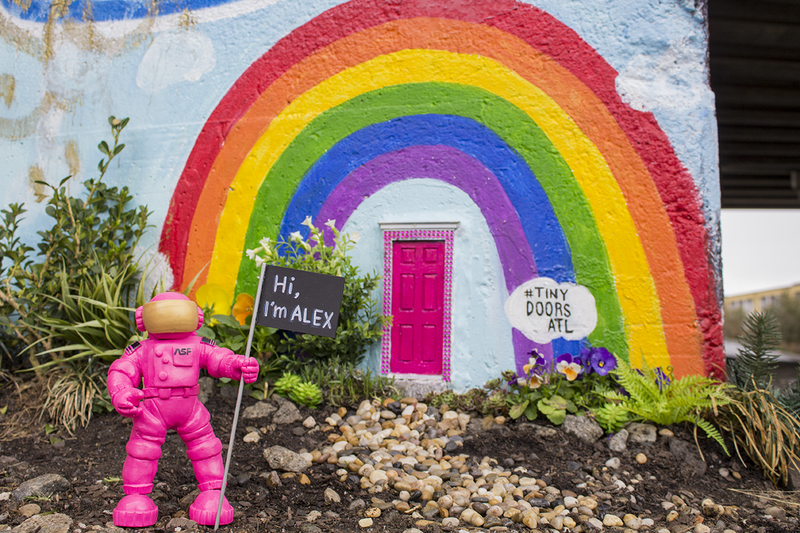 Tiny Doors ATL installs 6-inch tall doors in strategic places throughout the city. You could walk past these tiny installations for months and never see them. 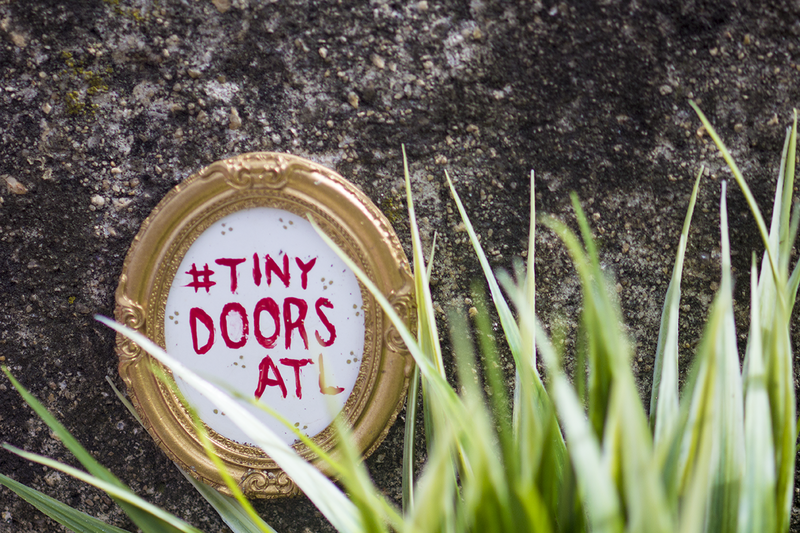 Next time you’re taking a stroll, be sure to keep an eye out for Tiny Doors ATL! ALEX (Atlanta’s Lead EXplorer) takes form as both a tiny and live-size mascot for The Atlanta Science Festival. You can get your picture taken with her this year at our range of events spanning between March 9-24. This colorful door resides near the Old Fourth Ward Skatepark on The Atlanta Beltline and sees a ton of foot, bike, and running traffic each day. Also located along The Atlanta Beltline, this French style door resides near the Eiffel Tower and awesome vintage store Paris on Ponce. 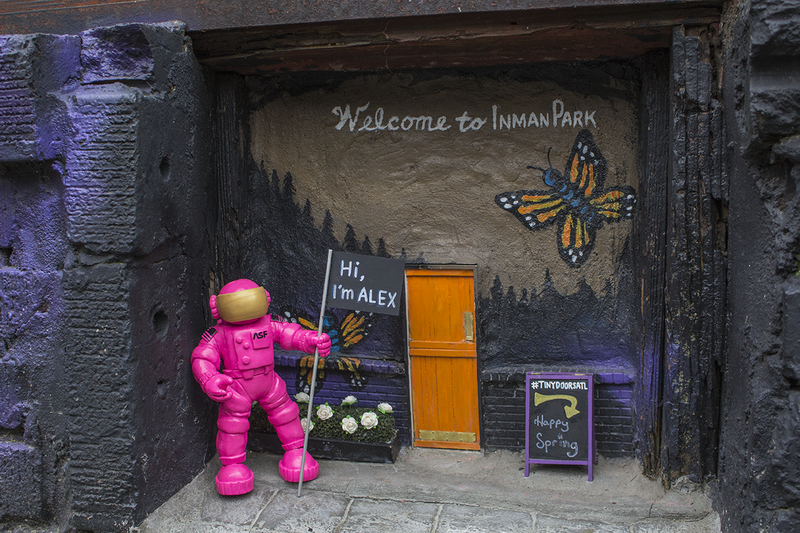 This tiny door can be found 15 feet from the famous King of Pops walk-up window in Inman Park. It even has its very own tiny sandwich board, sidewalk, and tiny mural painted by artist Chris Veal (the original painter of the larger mural on the same wall). 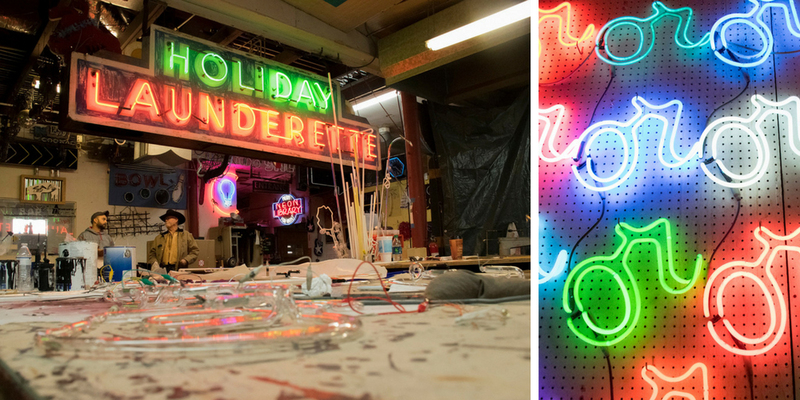 You can’t wander far in Atlanta without seeing the bright, colorful work of The Neon Company. From The Vortex’s iconic skull logo, to the Majestic Diner’s massive outdoor signage, to the hundreds of custom pieces for TV shows and movie sets around the city, the team at The Neon Company specializes in creating neon signs that satisfy the visions of their customers. What most people don’t realize is that each piece created is a result of rare artistic craftsmanship and calculated science. The Neon Company studio is filled with hundreds of beautiful, glowing neon creations. Opened in 1984, The Neon Company has perfected the art of creating neon signage and art for the bustling city of Atlanta. Gregg Brenner, the founder, president, and CEO (Chief Electron Officer), started the business with a background in science. With an undergraduate degree in biochemistry, Gregg taught high school science in DeKalb County for five years. During his time teaching, playing with neon became a hobby of Gregg’s and grew to become something much more after he received his Master of Science degree from Georgia State University. 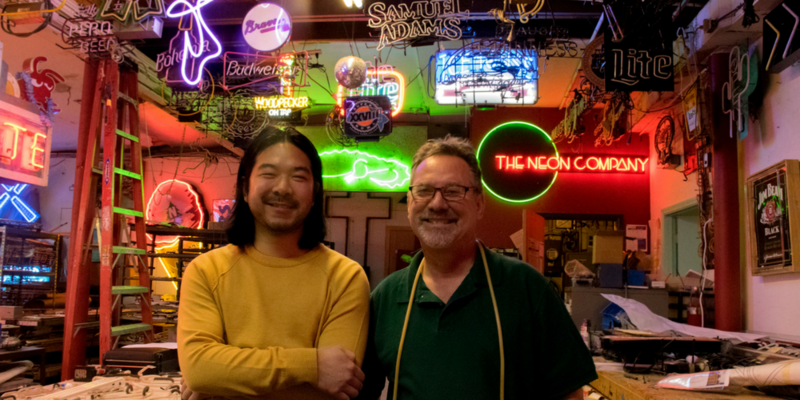 We wanted to hear more about the science behind Gregg’s colorful light displays, so we popped into The Neon Company studio along with another local expert on the science of color and light. Eric Shen, a chemist from Georgia Tech, works in the field of organic electronics. His research on electrochromic materials – materials that change colors when zapped with an electric current – provides him with a unique perspective on how color and light can be manipulated. Eric helped give us some insight into what’s going on at the atomic level with the fascinating light displays that The Neon Company produces, along with how it could connect to his own research. Eric and Gregg discuss the many connections between their two fields of work. In the end, they both deal with light, energy, and electrons! 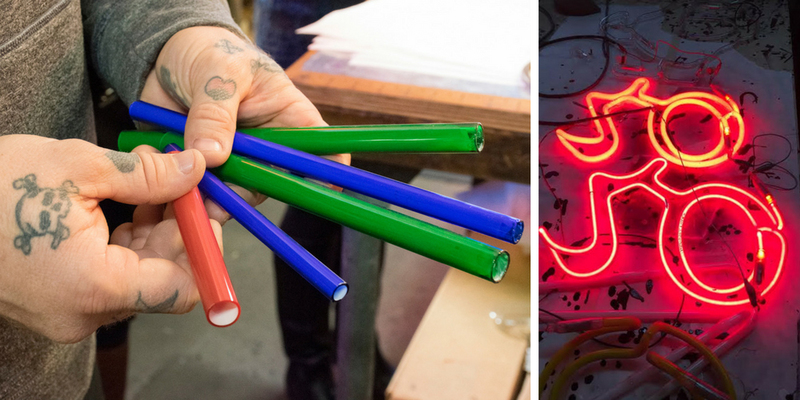 The neon process can be broken into two parts: the art and the science. Creative design and glass bending involve a lot of artistry. Those steps are immediately followed by the introduction of science and technology when assembling and installing the signs. The Neon Company receives many neon requests ranging in difficulty. 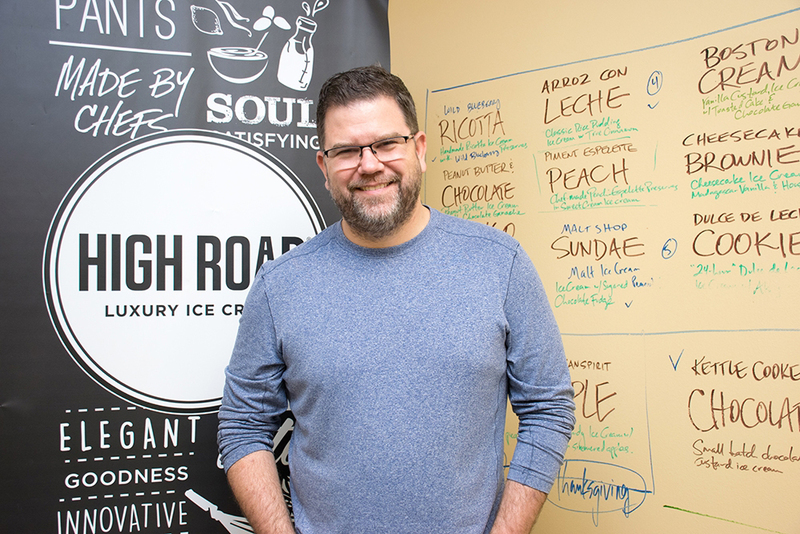 “We get everything from folks who are just creating their business and don’t know what they want, to well-established companies like Coca-Cola who need a custom job,” said Gregg. Once the team has an idea of what the job entails, the process starts off at a Windows 98 computer. Yes, you read that right … A graphic for the neon sign is made on a Windows 98 “art” program, which Gregg explains is “so old that no one writes viruses for it.” The computer sends the graphic to a plotting machine that uses a Sharpie to draw out the design on a piece of elongated paper. This outline is used as a stencil for the neon glass benders to work against. Though some might look at these machines as part of the stone age, Windows 98 provides a dependable server for the programs and equipment needed to produce accurate stencils. 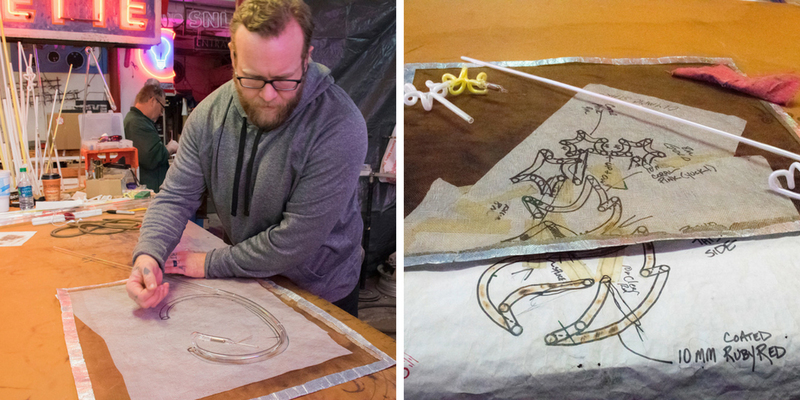 Once the patterns are made, the work gets handed off to Blaze Pearson and Sue Erck, the company’s neon glass benders. 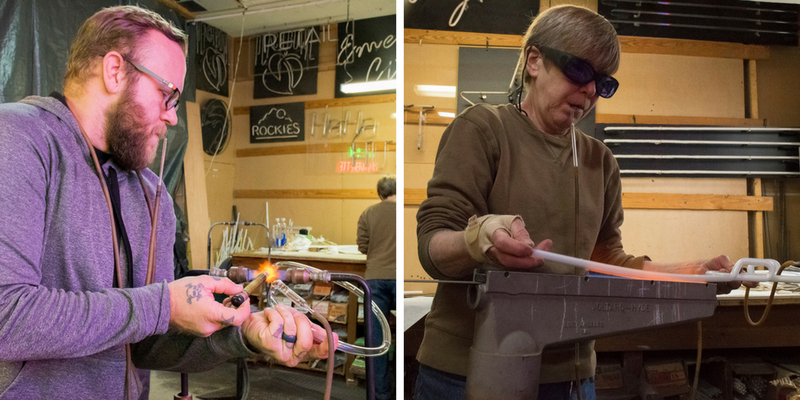 Blaze has been bending glass for about 15 years while Sue and Gregg have been bending for 30 years. “This is the highest level of skill in the shop. 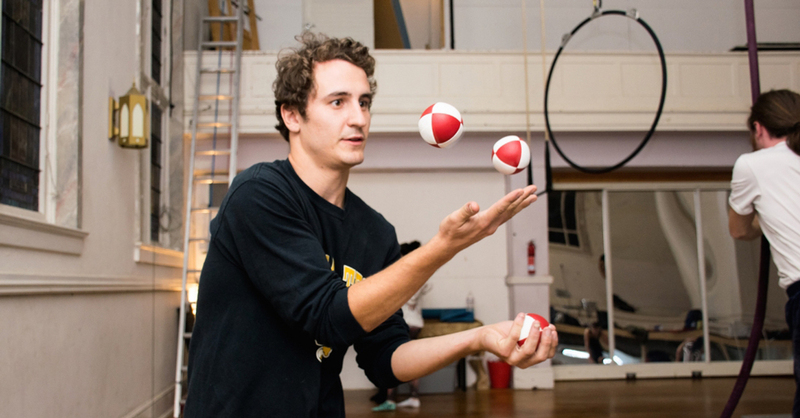 It really takes a lot of practice,” Gregg explained. Blaze uses a hand drawn stencil to create a star out of coated glass. The printed outline is placed under a brass screen top so that the glass benders can lay hot glass on top of the paper as they work. 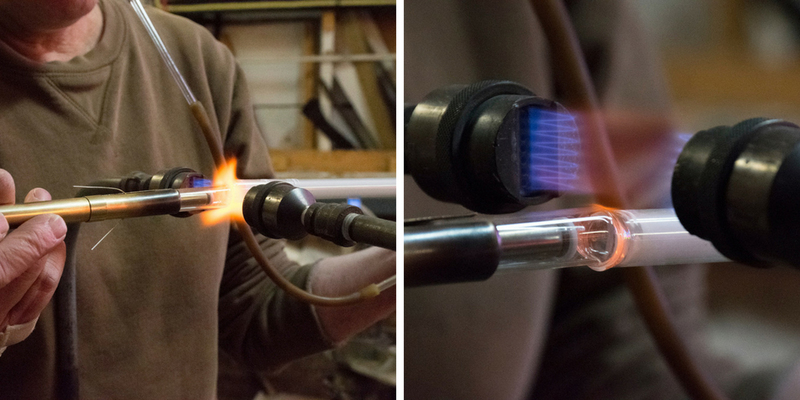 Using a variety of flames and torches, the glass bender heats up areas of the glass tube that needs to be bent in order to make the correct shape, but as the glass bends, the bent area will start to flatten, similar to how a garden hose would. In order to keep the correct diameter, Blaze and Sue use a “blow-hose” to blow air into the tube near those bends. 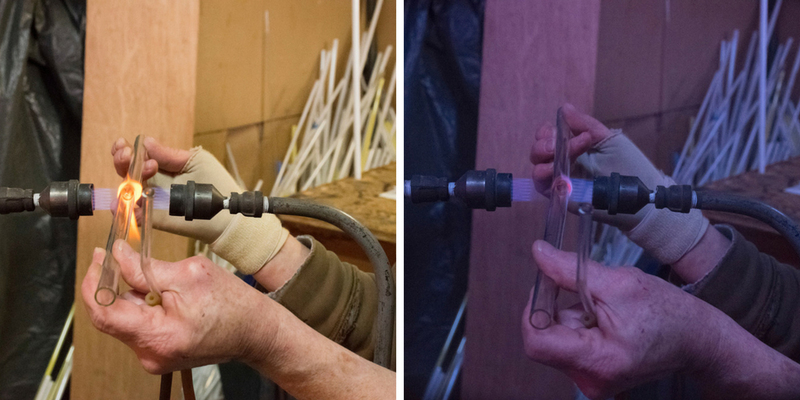 Blaze and Sue use a “blow-hose” to maintain the diameter of the tubes when bending. The glass they work with hardens quickly, which means there is less time to fix mistakes. Gregg explained that abstract neon signs are the easiest while precise lettering and large circular shapes are the trickiest. 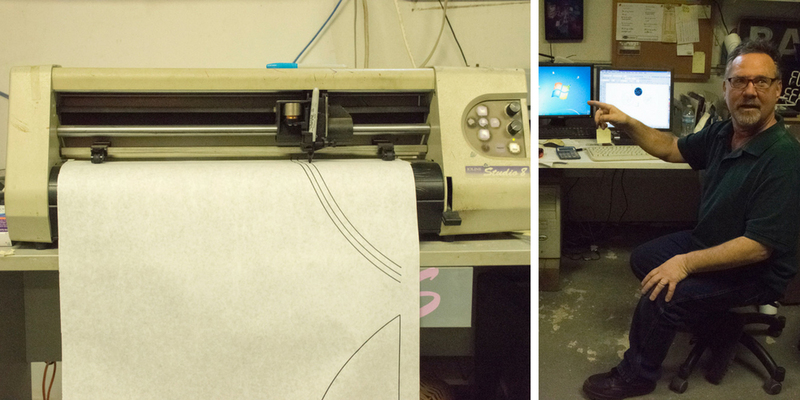 Since the variety of signs they make are so large, the team at The Neon Company is never bored. Sue wears goggles while working, because they help filter out specific wavelengths of light from the flare so she can see which areas of the glass are heating better. You can see the difference in the two images above! Deemed the “kissing technique”, electrodes are added to the ends of each piece, heated, and welded together before the final assembly. Once the tubes have been properly shaped, it’s time to introduce the chemistry. Before you can fill the tubes with gases that light up, you have to clear out any air and moisture from inside the tubes with a vacuum pump. After the vacuum does its job, a zap of electricity is added while raising the temperature of the tube in order to sterilize the inside and eliminate any remaining air. Once the tube is finished sterilizing, the team has to wait for it to cool down to a temperature low enough to add in the gases, which gives the neon sign its color. Gregg walks us through the bombarding process which cleans and prepares the tubes to be filled with gas. The Neon Company mainly uses two gases – neon and argon. Both of these gases are clear when they are added to the tubes, but when electricity is added, they glow: neon glows red/orange in clear glass, and argon gives off a blue/lavender light in clear glass. So how do these gases go from clear to colored and why do they light up? “With neon lights, you are applying a huge voltage, which energizes the electrons of the gas atoms. 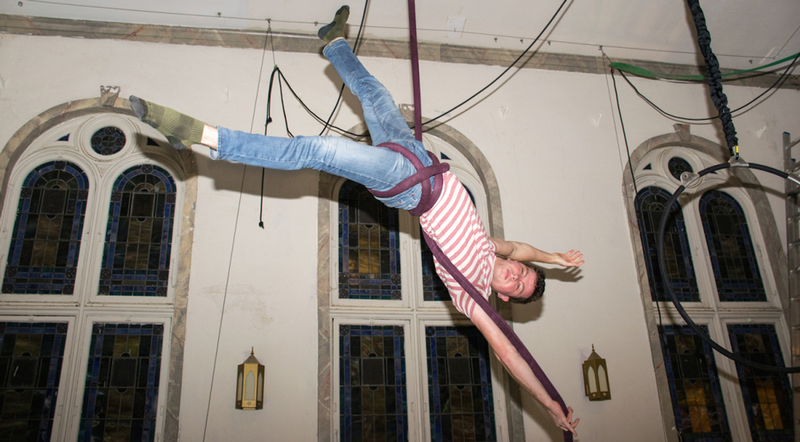 Eventually, all that energy has to go somewhere, and it gets released as light,” Eric tells us. The unique color associated with each gas is connected to the number and arrangement of electrons in the atoms making up the gas. Powder coated tubes (shown in image on the left) distribute light more evenly compared to other colored tubes. The difference can be seen in the two tubes shown in the right image. Now, as we know, neon lights come in a variety of colors, not just red and lavender. 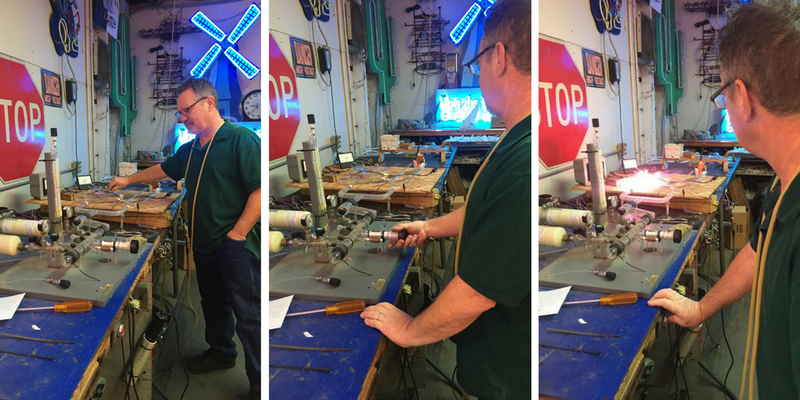 Gregg shows us how he can manipulate the color by using either argon or neon, changing the tube color through stained glass or powder coating (which distributes light more evenly) and by adding mercury. A few drops of liquid mercury will vaporize in the tube and create other color options. Once the correct gas has been added, the tube is sealed off and gets set up for installation. The pieces are then connected to a transformer to be powered. The transformer generates about 15,000 volts and 60 milliamps, which is what provides that jolt of energy to the electrons in the atoms of the gas in the tube. As Eric told us, the energy goes in as electricity and comes out in the form of light and heat, giving us the neon lights that glow as they should. After being correctly powered, the neon signs are ready to be installed. 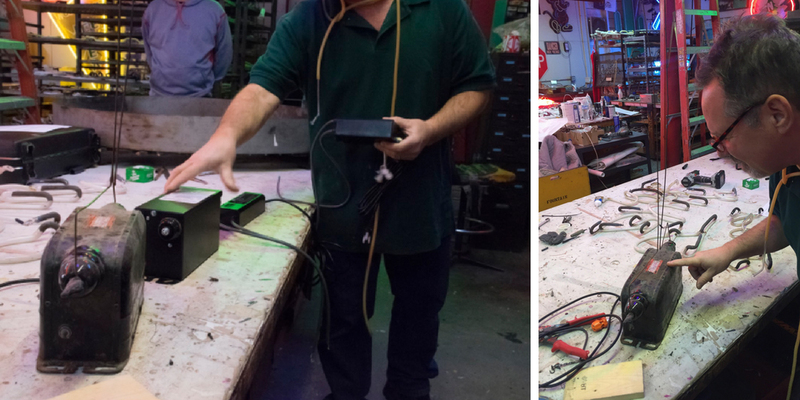 Gregg shows us a very old transformer (shown in the right image) compared to the types of transformers used today (shown in the left image). Each and every neon sign and piece of art that The Neon Company produces is the result of incredible skill, science, and passion. In a world where businesses are trying to cut labor and have everything be run through machines and computers, Gregg, Blaze, and Sue at The Neon Company keep their craftsmanship alive and well. “The neon industry is shrinking. It’s now more of a small, decorative industry [compared to the lighting industry as a whole],” commented Gregg. Eric, however, had other ideas on how to grow the field. As we were clearing out, the two started talking about how they should experiment with coating Gregg’s neon tubes with Eric’s electrochromic paint-like films to manipulate the color of the lights even more. Who knows if that will ever come to fruition, but what we know for sure is that the city of Atlanta continues to glow bright with The Neon Company’s handcrafted, neon signage lighting its streets. 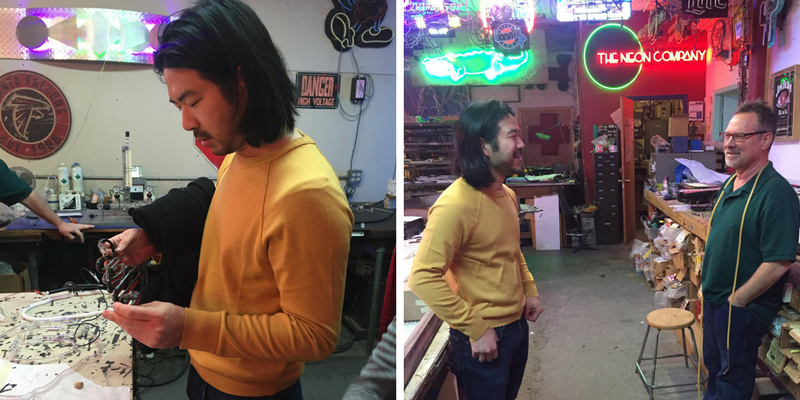 A big thank you to The Neon Company and Eric Shen from Georgia Tech for walking us through the magical science behind neon lights. Stay tuned to our website, Facebook, Twitter, and Instagram for more Awesome Science of Everyday Life features and other festival updates!